The unit protection responds to internal faults only. The use of channel to compare conditions at the terminals of a power line, provides the only selective means of high-speed clearing of end zone faults. In many ways pilot protection is analogous to differential protection of buses , transformers and machines. - Limits of possibilities of conductor burn down due to overloading and in general minimizes damage to the line. - Improves transient stability of system by quick disconnection of faulty line. - Permits high speed reclosing, which is successful, will improve transient stability or minimize outage time or poor voltage conditions on portions of the system load. Unit type feeder protection includes pilot wire protection and carrier current protection. Merz-price or differential circulating current protection was widely used in U.K and U.S.A. In earlier years d.c. pilot schemes were used. Now they are replaced by A.C. pilot schemes discussed in this section. The differential circulating current protection principle can be readily applied to feeder protection. Two CT's are connected in each protected line, one at each end. Under healthy/external fault. conditions the secondary currents are equal and circulate in pilot wires. 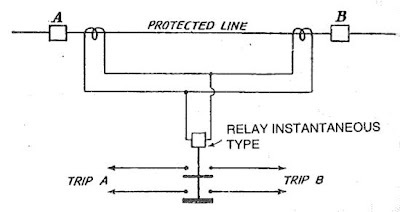 The relay is connected between equipotential points of pilot wires. For external faults and normal condition the differential current of two I1-I2 CT's is zero and relay does not operate. During internal faults this balance is disturbed and differential current flows through the relay operating coils. The circuit breakers at two ends separated by a long distance, there is a need to have relaying going at each end associated circuit breaker. In line protection (Fig. 1), relaying point falls in the middle of the line. This means added difficulties. Fig. 1 Pilot wire protection of line. To solve this problem the circuit is modified (Fig. 2) by providing two relays. one at each end. Fig. 2 Use of two relays, one at each end. Another method (Fig. 3) is by using split pilot principle which uses a three core cable as pilot. Fig. 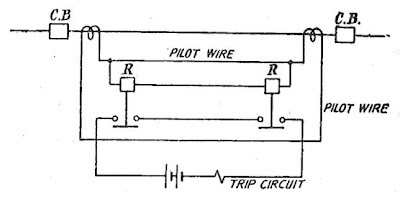 3 Pilot wire relaying with split pilot connection using 3-core cable for pilot connections. Pilot Wire Relaying using voltage balance. 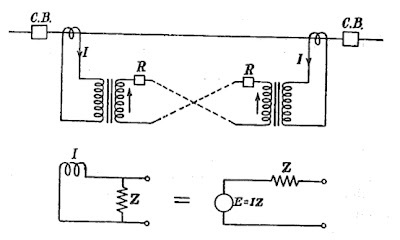 In this method the secondary currents are replaced by or converted to an equivalent voltage source of fairly low impedance. The equivalent at two ends are compared as shown in Fig. 4. For health condition., no current flows through the relay coils. 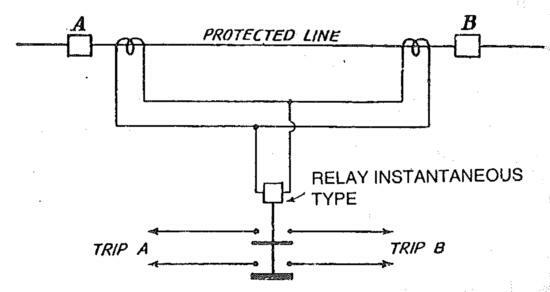 During internal fault current circulates through relay coil. Voltage balance system is a basically a differential system. Discriminating factor. Operating current at one terminal or an internal fault to an external fault with same primary current applied from that terminal. Referring to Fig. 6, consider a current differential scheme. Transley System. This is based on differential balance voltage principle. It has telephone lines as pilot wires. Advantages of higher currents can be used. Arrangement consist of induction relays at either ends. Schematic diagram is shown in Fig 7. Limitation of Pilot Wire Protection of Line. 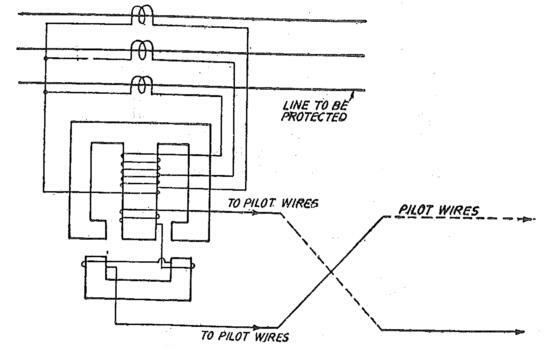 Pilot protection needs additional expenditure of pilot wires, the pilot wires need supervision to check. Open circuits and short circuits on pilot wires lead to relay failure. 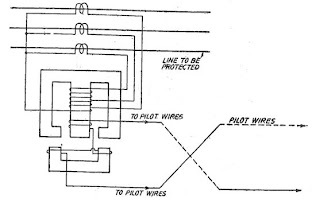 The pilot wires are put at the same time along with power conductors. In cable systems, pilot cables are put in the same trench of power cable. For short lines of less than 16 km the pilot wires give most economical form of high speed relaying. For line upto 16 km pilot wire protection is popular. It used even for lines upto 50 km. in rare cases. Beyond the length of 16 km. carrier current pilot relaying is more economical and preferable. 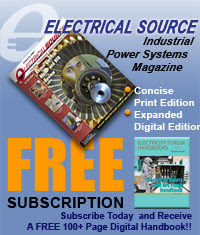 Voltages are induced in pilot wires due to the field of power conductors. This voltage should be limited to 5-15 volts. Overhead pilot wires are exposed to lightening and high voltage surges. They must be protected by means of lightning arresters. Similarly they should not come in contact with power circuit. According to the rules the voltage across pilot is limit to about 200V and current to 200mA. To avoid this trouble, automatic supervision is usually applied along with overcurrent fault detectors to prevent wrong tripping. The need to economize in the pilot cores has resulted in the use of current summation devices so that the polyphase line currents may be reproduced as a single-phase quantity. This enables the comparison over the pilot channel to the effected on single phase basis and the pilot cores to be reduced to a minimum of two. 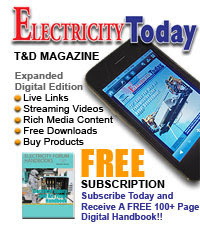 Most summation devices include transformers and can, therefor, be used to reduce the burden imposed by the pilots on the current-transformer by changing the impedance levels. A further advantage is the possibility of isolating the current transformers from the pilots. This enable the current-transformers to be earthed and the pilots to be without earth. 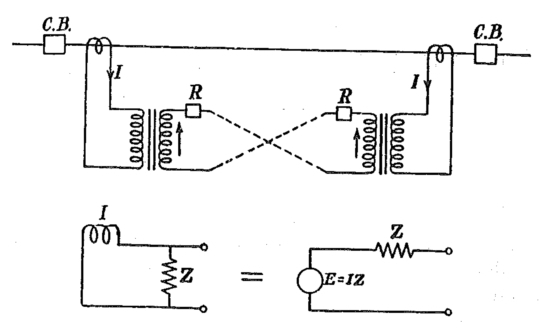 The most common device in use is the "Summation-transformer", which is shown in its simplest from in Fig. 8. 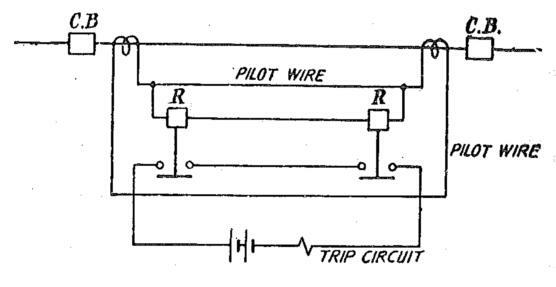 A common primary-winding is connected to the line current-transformer outputs, each phase energizing a different number of turns, from line to neutral. The arrangement gives an equivalent secondary output for the various types of fault, as shown by the table of Fig. 8 ; these can be easily be derived for any tripping arrangement by construction of the equivalent ampere turn vector diagram. 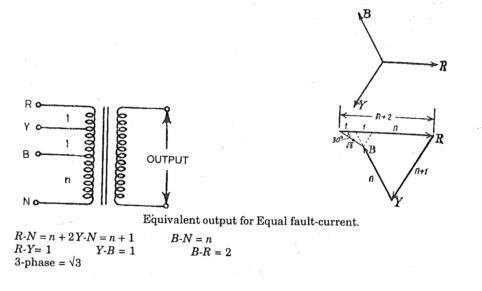 Such devices are not perfect as there are complex fault conditions, such as 2 : 1 : 1 fault-distribution on Y-B-R phase with equal R-Y and Y-B sections, which will give no output. Another example of the limitations of summation transformers is a double earth fault with a resistance earthed neutral. 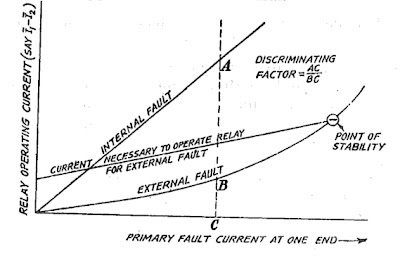 In the ratio of phase fault current to earth fault current is of the right order, it is possible with some double earth-fault, for the output to be zero or very small.